"Derby College was very important to me, without it I wouldn’t have had the confidence to go to acting school. They recognised my abilities, encouraged me and were really supportive." As a teenager Danny Shooter lacked the confidence to get involved in school shows and plays…but deep down he knew he wanted to perform. So when he heard positive reports about Derby College’s A Level Performing Arts course he enrolled – and he hasn’t looked back since. Now his CV includes a key appearance in one of David Bowie’s last music videos. Called Sue (Or in a Season of Crime), Danny plays the part of Bowie walking in silhouette. In addition to appearing in other music videos and short films, Danny – whose equity name is Shooter but grew up as Cooke – has toured Spain with the Valencia-based Forum Theatre and Education group. He is travelling in Italy next year with a similar organisation. 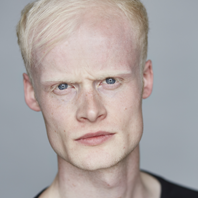 Passing with two Distinctions and a Merit, Danny landed a place after a three hour audition with the prestigious East 15 Acting school in Southend where he graduated with a 2.1 degree.